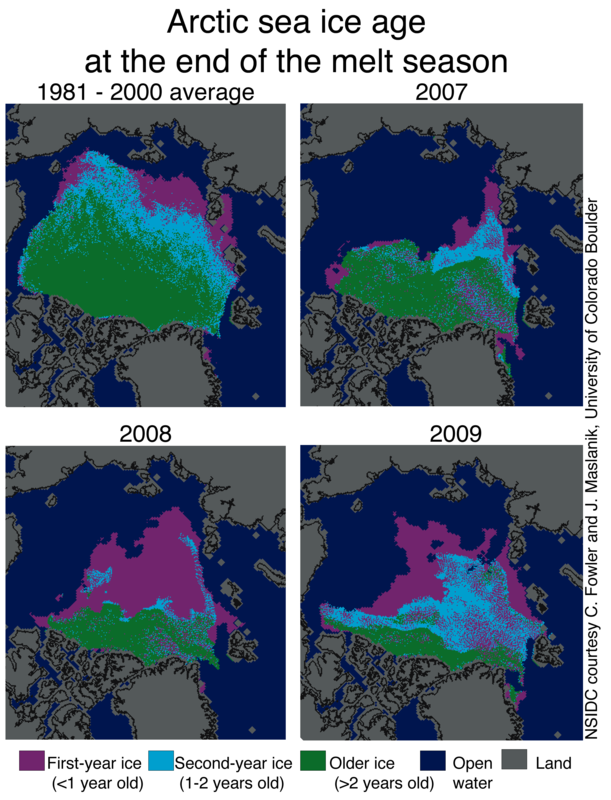 2007 Sea Ice Post Mortem | Watts Up With That? By now, we have all been bludgeoned senseless with talk of how Arctic Ice dramatically declined in 2007 – “much faster than the models.” We were told by the experts that this rapid decline would lead to an ice-free Arctic in 2008, 2013, 2030, etc. – not to mention 1969 and 1922. I don’t buy it. The idea of an ice-free Arctic seems implausible to me without a dramatic change in climate. Let’s start by looking at what really happened in 2007. 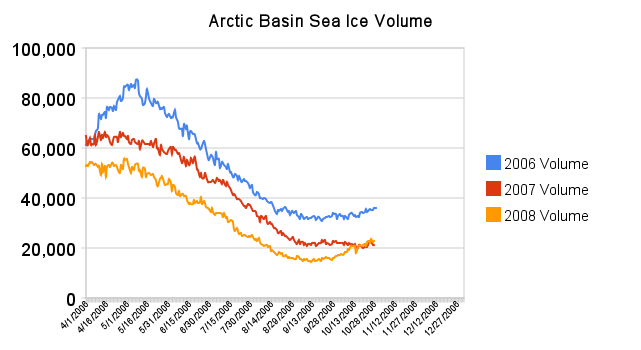 The graph below (calculated from PIPS maps) shows the average ice thickness in the Arctic Basin for 2006 – 2008. 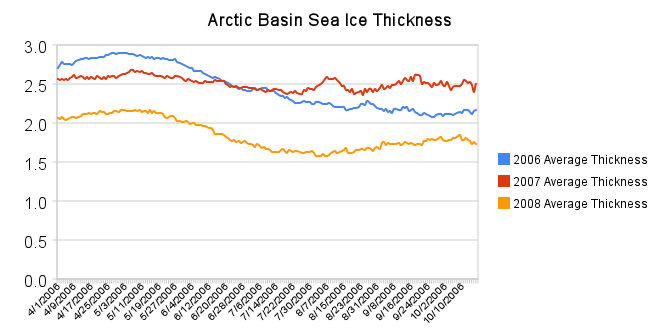 Note that the average thickness of the ice in 2007 was fairly constant through the spring and summer. In fact, 2007 had the largest average summer thickness. This is solid evidence that the low extent in 2007 was primarily due to horizontal melt and compaction of the ice, rather than vertical thinning. Given that there was no change in average thickness, in order for the ice to disappear it would have to melt horizontally. As you can see in the graph below, the volume loss came to a hard stop in early September. 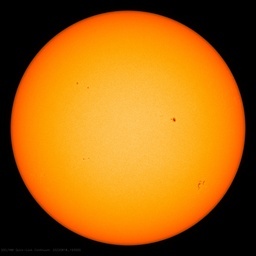 The sun is too low by September for significant melt to proceed. There just isn’t enough time in the Arctic summer for all the ice to melt. 2006 was highest in the DMI record and had 30% greater summer extent than 2007 – but the 2007 late summer ice was almost 20% thicker. 2007 was never in any danger of a complete meltdown. The video below shows the thickening of the ice in 2007 as it compressed horizontally from the wind. The next problem with an “ice-free Arctic” is that summer temperatures north of 80N have not changed over the last 50 years. You can see that in the DMI graphs. If anything, recent years have had colder summers near the pole. High Arctic warming has occurred in other seasons, but not during the summer. The melt season is very short at the pole, and some summers have no melt. GISS doesn’t have much data north of 75N, but the few data points they do have show little or no summer warming. In 2008, the North Pole started with first year ice. Mark Serreze bet that this would lead to an ice-free pole. It didn’t happen, in spite of relatively warm temperatures at the pole. In 2008, the onset of melt progressed more quickly than in previous years, and melt ponds persisted longer and later than usual. An ice free pole could not occur without dramatic summer warming. There has been almost no summer warming in the high Arctic over the last 70 years. 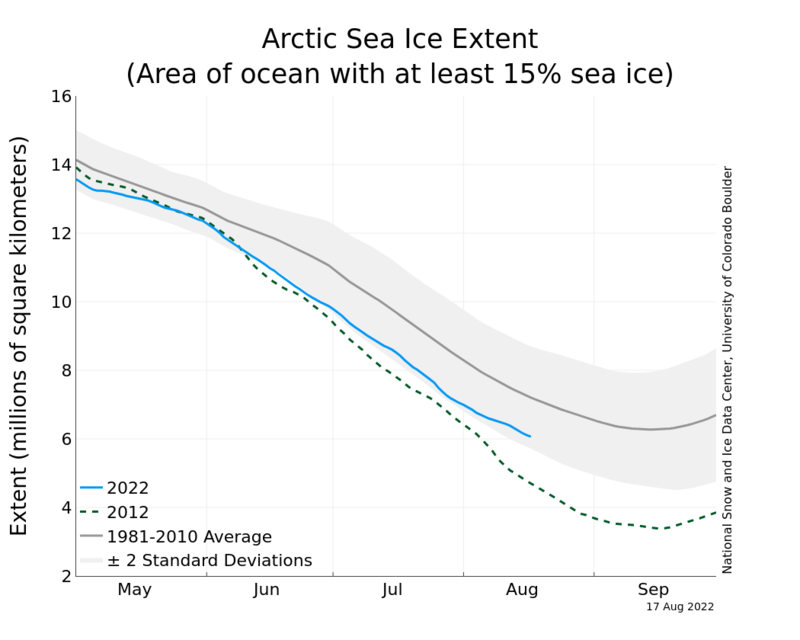 The melt season is too short to have an ice free Arctic. Roger Pielke Sr. did a study which shows that the length of the melt season has not changed significantly. 2008 started with first year ice at the pole. It was a warm summer at the pole, and the ice did not disappear. There will never be a summer which starts with younger ice than 2008. Linear projections of an ice-free pole are incorrect. It is much more likely that the slope will tail off asymptotically. I propose that 2008 ice volume was close to the theoretical minimum, until Arctic summer temperatures increase dramatically. Dress appropriately the high Arctic. It is too cold for a bikini. June 9, 2010 in Arctic, Sea ice, Uncategorized. Haha – maybe we can argue about the meaning of “everyone”! The next problem with an “ice-free Arctic” is that summer temperatures north of 80N have not changed over the last 50 years. 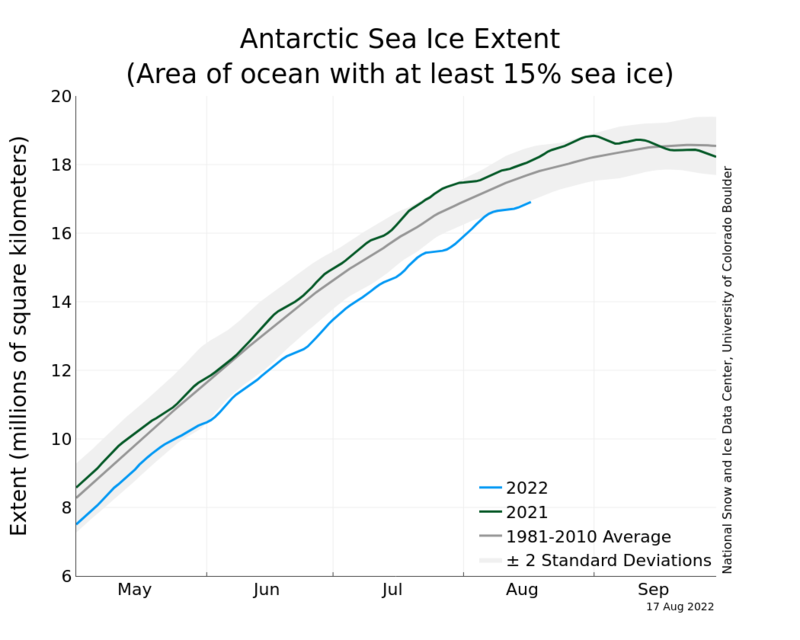 you’ll note that Antarctic Sea Ice Extent has increased very rapidly in the last few months and now appears to exceed 2 standard deviations (an admittedly misleadingly narrow normal range due to NSIDC’s choice to exclude 2001 – 2010 in order to make their Arctic chart look scarier/abnormal). Can we call this rapid increase in Antarctic Sea Ice Extent a Death Pile and start scaremongering about a pending ice age? Kidding of course, but WUWT? After a two day exchange at the Holy Grail Arctic Ice thread I see it seems the reason some won’t say there has been a recovery in Arctic ice since 2007 is because they are believing global warming could be happening so in the long term that warming will cause a continued downturn, the infamous ‘death spiral’, to occur and the increase since 2007 is just an aberration. But that was not predicted by those who say Arctic (North Pole) is could be gone by 2013. If you look at the graphs and satellite images you can see that there has been an increase in Arctic ice since 2007. That ‘ice free’ prediction is doing very poorly. Ice is increasing not decreasing. I think it comes down to whether you think the glass is half full or half empty. Or you could just go with the data and say the glass has fluid to the median point. I can’t see good or bad from what I see in Arctic ice data. It just is in the range of what is expected from it. So we don’t understand everything. 2007 was just another year. And so is this year. This is the way the world is. This stuff of guessing about Arctic ice annoys me because I have already explained that Arctic warming has nothing to do with any greenhouse effect and is caused by warm currents entering the Arctic. If you read “What Warming?” you will learn that it started with a rearrangement of the North Atlantic current system at the turn of the twentieth century which set the Gulf Stream unto its present northerly course. The Gulf Stream today enters the Arctic in a broad front between Iceland and the Scandinavian peninsula and keeps the Russian Arctic ice free in the summer. It has eaten away approximately a third of the sea ice that would otherwise exist in its absence. In addition to the Gulf Stream a smaller amount of warm water also enters the Arctic through the Bering Strait. Usually it is enough to keep the Chukchi Sea, just north of the strait, ice free, but thanks to winds more than the usual amount came through in 2007 and cleared a large bubble of open water just north of the strait. The Gulf Stream side of the ocean at the same time changed only a little. Check out my Figure 14 to see the path of these warm currents entering the Arctic. They are sufficient to explain all present and past Arctic warming, no carbon dioxide or a magical “arctic amplification” required. Umm.. if the ice loss in 2007 was not as bad as thought, doesn’t that mean the “recovery” since then is to that extent illusory? I note that the current extent is not looking good. Any data yet on the volume? What was the difference in Co2 level between 2006 and 2007? Obviously the loss of ice in 2007 when compared to other recent years was due to something else besides Co2. 2007 also had a lot of high pressure in the Arctic, allowing extra sunlight and extra solar heating which contributed to melt. Recent weeks in the Artic have had a lot of high pressure, and we see record low levels of extent. So why did wind and sun in 2007 contribute to a 30 year record low ice? Is this the first time in 30 years that we have had wind from that direction, and that amount of sun? Or did Co2 help out a little…. And on Arctic temperatures not getting above freezing much, melting ice absorbs as much energy as heating water by 80 degrees. Until the ice is melted temperatures will not be able to rise significantly above freezing. This is why high Arctic temps have been increasing in winter but staying constant in summer. Temperatures over Arctic sea ice (more than ~100 km from land) rarely go much above 2 degrees C since the surface is constrained to the melting point of (slightly saline) ice. This just means all the available energy melts the ice directly rather than warming the atmosphere. So you don’t really prove anything here without accounting for how anomalous (or not) the solar radiation near the North pole was in 2008 during June and July. So, if the Arctic were to see no compaction events (it hasn’t even gotten to above zero Celcius yet in the 80N Arctic), would it then match the Antartic anomaly? The water from South of the Bering Strait on through it into the Arctic is -1C or below. It ain’t the water nor is it the air. I had intended to include links to other webcam data sets but hit submit before I had added them. Here they are. Are you suggesting that CO2 affects solar radiation at the pole? One other thing worth noting from the North Pole webcam link is that the refreeze of surface melt water begins well before the summer minimum ice extent in most years. Sorry to be so disjointed in my posts, but the warmists have accomplished at least one worthwhile thing, they’ve driven me to drink. Current volume is higher than 2007-2009, and lower than 2006. I will provide more detail in this week’s WUWT sea ice news. Ten days to the top. The sun’s ready for the downward slide! If find the reassuring tone of the article at odds with reality. This is an up-to-date chart of sea ice volume anomaly from the Polar Science Center. As can be clearly seen, the volume loss has sped up since 2007. Seems fishy to me. I’ve read the article from 1922 and could not find any mention of an ice-free Arctic. And it has been established before that Goddard’s calculations based on PIPS 2.0 can’t be trusted. It has certainly been established that trolls come on here and post barefaced [snip]. But not to worry. NASA is now on the case. Sounds pretty blue-chip, state of the art scientific stuff to me. They are obviously starting off without any preconceptions! Can you confirm that you are now taking into account ice content in these calculations? If so, I presume you will be putting errata on your previous posts as they ignored that critical input and therefore presented incorrect values for ice volumes and thickness. Yeah, let’s see. The 1922 article gives account of exceptional ice conditions around Spitzbergen and an unusually warm summer in Arctic Norway. There’s also talk about the very warm Gulf Stream that made it probable that the favourable ice conditions were to continue for some time. There’s no hint whatsoever that the entire Arctic was going to be ice-free. And several posters have pointed out on the latest Arctic sea ice news thread that Goddard can’t get his PIPS ice concentrations right. So who’s the troll now? The “Researchers from the space agency hope to provide the most detailed research yet on how global warming is devastating the ocean’s ecosystem.” quote is from the Telegraph, not NASA. I think that the first place to look for an explanation of arctic warming is as a purely regional factor. My geography teacher told us about 60 years ago that one man’s north wind is another man’s south wind. I live in France about fifteen miles from the mediterranean sea; winters are usually mild with the first and last air frosts between mid December and late February normally. However the last three winters have been unusually cold, culminating, in last winter, with an air frost on the sixteenth of October, eight days of snow in early March and a minimum temperature of two degrees centigrade at two o’clock in the afternoon on the second of May! Needless to say that northerly winds have been much more common over the last six months than is usual. So if air of polar origin has been leaving the higher latitudes it must have been replaced by warmer air from the south. Therefore any polar warming can be, a priori, regarded as a regional phenomenon unrelated to global temperature changes. The concentration of ice is the Arctic Basin is pretty close to 100% this year. If you are concerned that PIPS does not consider concentration when calculating the average thickness of a grid cell, then multiply all of my 2010 numbers by 1.0 . For example, if I report an average thickness of 2.55 metres, then multiply that number by 1.0, and you will get a corrected number of 2.55 metres. Have you looked at an old Russian article that is linked to at the ICECAP site. It looks at fishing yields in light of cyclic arctic temperature changes. What makes this so interesting is that it has nearly 2 full cycles of ice and temperature data going back almost 150 years. Any scientist should know that these types of processes are not linear but rather exponential, sigmoidal, etc. Even if the asymptotic level of ice is zero, the melt will get there nonlinearly. A linear projection at the start of an exponential decay always overpredicts the point at which the function hits the asymptote. Seriously, every scientist should know this. Why are some humans obsessed with the amount of ice at the NorthPole? For most of human existance, the practically no human even knew there was a north pole. If a tree falls in a forest and no one is there to hear it, did it make a sound? If the North Pole warms up and no one is there to measure it, does it melt ice? Sea Ice Extent. 2009 melt start 5 March at 13.97 million sq/km. 2010 melt start 31 March at 14.41 million sq/km. Head start for 2009 413,000 million sq/km. At 31 March 2010 had made up the difference both now at 14.41 million sq/km. MELTING; in 2010 the first million sq/km melt took 26 days (2009 35 days) Second million sq/km took 13 days (2009 17 days) Third million sq/km took 15 days (2009 19 days) Fourth million sq/km took 15 days (2009 18 days) It took 69 days in 2010 to melt 4 million sq/km and it took 89 days, 20 days more, in 2009. Multi-year ice in 1980 between 80 and 90 %. Multi-year ice now just 18%, the dying remains jammed against Canada and north Greenland. Arctic sea ice recovered? Definition of recovered please. Ice volume increasing? The arguments are highly unconvincing and improbable; wishfull thinking if you like. Correction, drop the million behind 413,000. Hello, 2.55 x 1.0 equalls 2.55 Have I learned something today? Your values will therefore not agree with the Posey’s published data. Why are you persisting in presenting incorrect information? Hopefully you have “learned” how to identify sarcasm. Except that as of a few days ago concentration was actually about 0.9 which would give a thickness of ~2.29m. I think we are obsessing over small amounts of noise in the signal. To my physicist eyes, using the last graph Steve’s article, I see a slight downward trend from 1979-1997, then a more pronounced downward trend from 1997-2006, and then level from 2006 to present. Also the noise level seems to be around + – 0.5 million sq km, so the above trends do not appear to be significantly outside the noise level of the signal. Another 10 years of data and something more signifcant could maybe be said. Otherwise, I don’t see how much more could inferred from the data. You are pulling the usual straw man, arguing about different points than the article. I am discussing thickness and volume in the Arctic Basin, which are key factors in determining the minimum. June extent in the Barents Sea, Hudson Bay, etc. has almost no impact on the minimum. It is nearly irrelevant to this discussion. Why do you persist with the uncertainty related to concentration? The thickess ice is in the area with the highest concentrations. The thinner ice is in the areas with the relatively lower concentrations. If you multiply each local pixel by the concentration value, you increase the weighting of hte thick ice and decrease the weighting of the thin ice. Hence, the result is an average thickness that is GREATER THAN the average derived without such a correction. The uncertainty in Steve’s calculation is small and has a conservative bias. Since the analysis is of TRENDS, so long as he uses the same method throughout, for all data points, the error to the trend is very small. Do you think that PIPS does not consider concentration when calculating the ice thickness of a grid cell? Regardless – ice concentration in the Arctic Basin (in regions which PIPS shows ice) is close to 100%. Not if they were deaf. As for melting, no it doesn’t, being there to measure is a melting law of nature. Good night, I’ll sleep peacefully. Unlike your plot, it does not show an impossible decrease in volume after the September. My plot clearly shows that the decrease in area starting in August was due to the ice being compressed into Greenland, causing an increase in the average thickness while the volume actually increased slightly, probably as the thicker ice was less liable to melting. The PIPS 2.0 data look like they can give some insight into the evolution of the arctic ice, but not if you are unable to do the calculations correctly. * An ice free pole could not occur without dramatic summer warming. So you “win the game” by setting the goal to the worst case possible, complete and total loss of all ice. Anything short of everything means you were right and “they” were wrong. And by implication, the fact that the amount of ice has progressively decreased for decades, and will eventually result in an ice free summer pole, is meaningless simply because a complete and total melt hasn’t happened yet. It’s like saying you are going to live forever, because you haven’t died yet. * There has been almost no summer warming in the high Arctic over the last 70 years. A convenient cherry pick. There has been dramatic warming in the spring and fall, but summer warming is pretty much capped by the fact that there’s just no way to get more than 24 hours of sunlight out of a summer Arctic day, and any GHG (or any other) effect is of course dwarfed by that volume of non-stop sunlight. * The melt season is too short to have an ice free Arctic. This is false, but even if it were true, what if the melt season gets longer, due to rising temperatures (as happened last year)? But at the base of it, you have no foundation for saying the melt season is too short. If spring and fall temperatures are warm enough, that will do it, and if those seasons also stretch to start and end sooner, and if cumulative years reduce ice thickness (yes, yes, keep reading), it’s a done deal. * 2008 started with first year ice at the pole. It was a warm summer at the pole, and the ice did not disappear. There will never be a summer which starts with younger ice than 2008. As such, your first statement is patently false. The only way for the entire pole to have only first year ice would be if it had all melted the previous year. So as soon as a year melts more than 2007, the following year will have more first year ice than 2008, but not “only first year ice.” Your statement equates to “if it didn’t happen in 2008, it will never happen,” which is just silly. You’re back to your “I can’t die, because I haven’t died yet” mantra. * Linear projections of an ice-free pole are incorrect. It is much more likely that the slope will tail off asymptotically. I assume this means tail off upward so that it never happens… a series that converges to some value short of zero. Some scientists, who get paid to study this more closely than you (and therefore spend a lot more time thinking about it) say the opposite, that when it happens, it will be shockingly abrupt. The idea that a process might accelerate, however, is neither counter intuitive nor at all unexpected, and so your statement that a particular outcome is “more likely” is unfounded — unless you’d actually like to prevent reasoning and evidence to support that assertion. There is no reason in the world to believe that Arctic ice would behave like a falling object (where air resistance increases with velocity) or a decaying element with a half life (where the loss is fractional, so less to lose means less loss), rather than like a nuclear explosion which reaches critical mass (which is a cascading chain reaction, which accelerates because each reaction results in ever more triggers for future reactions). More specifically, if you think of the simple case where exposed surface area results in more melting, if you have one very large chunk of ice, it will melt more slowly (less exposed perimeter) than a whole lot of small chunks. Eventually, that large chunk will get small enough to be broken by uneven melt, and wind and wave action. So mechanically, there is every reason to believe that this could be an accelerating process, if the ice gets thin enough to reach that point. And this is pretty much how the Arctic is structured, with a main mass clinging to the north coast of Greenland. It melts inward, from the edges, but it’s anchored by Greenland. If it gets thin enough, though, you could see it quickly and dramatically fracture and melt. * I propose that 2008 ice volume was close to the theoretical minimum, until Arctic summer temperatures increase dramatically. Time will tell. And yes, I have bookmarked this page. * Dress appropriately [for] the high Arctic. It is too cold for a bikini. Ah, dry humor which plays to people’s naive emotional side, equivalent to saying “look, everyone knows it’s cold up there, so how could anything possibly melt.” When all else fails, try a sarcastic, logic free appeal to emotion and personal experience. Well, time will tell how good your logic is, Mr. Goddard. And while you can smile for a few days if you turn out to be right, and say “look, I’m smarter than all of those silly scientists,” I want to be sure that you have the courage to make an appropriately humble post if you turn out to be wrong (actually, a whole series of them, given how much time and energy you’ve put into this whole “Arctic Ice isn’t and won’t melt” kick) — and we live to see an event which hasn’t happened in 700,000 years. Sarcasm? Just pointing out a useless multiplier, convince me it isn’t. The Posey paper ice volumes are largely for MARCH, not MAY. Your comparisons to the early May effective volume levels are thus erroneous. The most recent PIOMAS results don’t match the most recent facts that we seen for 2010. The area and extend in April and May of 2010, on average, were greater than the levels for the last several years, noteably 2008 and 2009. We have seen that published measurement data and PIPS calaulated thickness levels for 2010 are greater than the thickness levels in 2008 and 2009. We know that in each of those years the amount of multi-year ice has increased from the prior year, so the trend toward thicker ice in 2009 and 2010 makes sense. While both the area and thickness inputs to volume have INCREASED, the PIOMAS plot indicates a relative volume decrease. THAT DECREASE, does not fit the data available from other reliable sources. Hence the questions. There seems to be confusion about concentration and volume, perhaps deliberate to muddy the frozen water. Thickness and concentration are not well correlated, so any volume calculation needs to use both. I am unsure whether Steve is unwilling or unable to combine the two datasets, but while he persists in using just thickness he is producing erroneous results. The impossible decrease in total volume after the fall equinox in his 2007 plot is just one example of the misleading nature of Steve’s calculations. Forgot to say, via RealClimate (your #240, which unfortunately did not close the subject) and DotEarth, which is struggling with the usual cloaca of denial. I love the idiot savants … and appreciate your hard work on WUWT. Trolling on behalf of RealClimate is hard work. The ice front continued to melt “after the equinox” in 2007 because of unusually warm water and winds in the Beaufort Sea. The only thing that is “impossible” is trying to have a sane conversation about this topic with you. Reread Posey’s paper. Six of the figures are for May, one for March. I only included the May values to calculate a correlation of -0.6 between Posey’s and Goddard’s values for ice volume. Steve’s calculations are obviously wrong. Just saw your thickness and volume plots for 2007 and 2008. It looks like fine work. Please continue your efforts with the 2009 data and the first 5 months of 2010 and overlay all the thickness data on one plot and the volume data on the other. I’m interested to see if the thickness and volume trends since 2008 using your methods. For some reason all the papers stop at 2008. Sea ice concentrations in the Arctic Basin are close to 100%. Multiplying by 1.0 would not change the numbers, even if your incorrect claim that PIPS doesn’t consider concentration was true. Steve doesn’t consider the PIOMAS model as valid, and would rather base his arguments on the PIPS 2.0 model, which even the NIC doesn’t take seriously, though we see in the latest NIC update for June, PIOMAS is mentioned. You can’t fault Steve’s general train of logic, but his basis (in using PIPS 2.0 data) is suspect at best. The next few years are going to be very telling. Steve et. al want to base some big recovery on a modest recovery in the summer minimum over the past few years, when as has been pointed out by one of our resident Ph.D. experts, we actually saw more ice lost from March to Sept in 2008 than 2007 because 2008 started from a higher level. Personally, I think PIOMAS is probably closer to the truth of what’s going on in the Arctic, and we must anxiously await CryoSat 2 to start putting out thickness data to confirm that. While I’ve stated for many months that I think this summer’s minimum will be less than 2008-2009, I’m not sure we’ll see us quite get as low as 2007, but we could if current trends continue! Be that as it may, I do think we’ll see at least one new record low before 2015, and it could be a dramatic one, as we’ll be seeing the solar max arrive in 2013 with increasing solar irradiance and lower GCR’s– all of which on top of the general forcing of GHG, could tip the scale enough for a dramatic summer low before 2015 (like 2.0-2.5 million sq. km). This would of course be very problematic for those who remain skeptical of an ice free summer Arctic Ocean this century. It seems to me that the sea ice extent ‘recovered’ is utterly debunked. The new diversion is sea ice volume using PIPS modelling (not data) that suits the purpose of claiming more ice volume, when there isn’t. The argument goes round and round turning a blind eye to errors. I am skeptical of self-created graphs. The sea ice thickness in the basin has thinned dramatically and thus I agree that the ice volume in the arctic basin are a key factor in determining the minimum volume and to a lesser extent the sea ice extent. Ice outside the Arctic Basin must melt first to 15% or less, in order for the melt to reduce extent. (measuring criteria) Once first year ice is gone the melt will slow as far as extent is concerned, but volume reduction will continue. Just because the sun goes in late winter, does not mean the ice melt stops from below. Wherever snow covers the ice the ice thickness growth slows dramatically even with much lower air temperatures. As the Arctic Ocean warms, the melt season will (and already has) become longer. ” told by the experts”, which experts and how many. “would lead to an ice-free Arctic “, isn’t this usually preceeded with the proviso “if this trend continues”. Projections using “if” are not claims. There is a lot more ice now than two years ago. Why are some of you in such desperate denial? I’m sure they do, I’m not so sure that you know how they do so. I suggested that you run a comparison calculation to show that you’re able to reproduce PIPS volume calculations. So far you have not done so, without that calibration I don’t take your numbers seriously (PIOMAS has done such a calibration with direct measurements). Close “only counts with hand grenades and horseshoes”, it’s currently less than 90%. Note that Linsay and Zhang’s predictions refer to *average* September ice extent, not the transient minimum, which is considered less predictable. Funny how it all boils down to two poles, ice or no ice, in reversed order when the article just point out the ludicrous alarmist bs what-if take on arctic sea ice. Soon they’ll probably start alarming people, again there by completing the circle, about the impending ice age, but with a twist, due to global warming. Because just what if it happens in the next 100 years, so hand over the tax-cash. Why would you show the low resolution map rather than the high resolution one? The claim is that you don’t consider concentration. If you look at the graphs and satellite images you can see that there has been an increase in Arctic ice since 2007. That ‘ice free’ prediction is doing very poorly. Ice is increasing not decreasing. Perhaps you were still thinking about March and April ? So you want me to double count concentration? Doesn’t sound like a very smart thing to do. Suppose for a minute that the Navy was not bright enough (as some suggest) to use concentration when making their ice maps. Since concentration is higher this year than previous years – that would skew the 2010 data higher. Some people here are quoting as contrary evidence, the same experts who forecast an ice free Arctic in 2013 – LOL …………. Maybe an asteroid will strike the Arctic in 2012? Or perhaps the earth’s interior will melt, like in the movie 2012? Mycelium use CO2 and scrub it out of the atmosphere converting it to food…. If you want to do something useful with CO2, bottle it up and spread it over crops during the day. There’s no hint whatsoever that the entire Arctic was going to be ice-free. And several posters have pointed out on the latest Arctic sea ice news thread that Goddard can’t get his PIPS ice concentrations right. NOAA : Arctic Ice free in 30 years? 2009 National Geographic: Arctic Largely Ice Free in Summer Within Ten Years? I thought the pole was at 90 degrees N.
You’re late to the party. Do you believe a model or actual observations. Here’s a primer (and 7 more before that). You don’t include concentration at all – that is why your calculations have a a negative correlation with Posey’s published volume figures while mine have a correlation of 0.99999. Why are you having such difficulty in understanding your error? No. Exactly what part of it am I not allowed to say? [snip ~dbs, mod.] It fits in well at WUWT. Reply: Since you don’t understand, it’s like this. If you invite somebody into your home, and they call you names, insult your intelligence, demean your family, etc. Would you not do at least one of the following? 1- Ask them to rephrase it? 2- Ask them to apologize? 3- Ask them to leave? According the the comments system, you’ve made 167 comments that have been posted. 1 rephrase request in 167 is not unreasonable. Oh my, you alarmists sure have trouble with the minus sign. No wonder you’re so “negative” on the state of the cyrosphere. This shows approximately + ~425,781 km\2, as of yesterday. For the record, I am taking the PIPS maps and using their data without modification. Some posters here insist that I should corrupt the PIPS data with inappropriate manipulations, which would actually bump the 2010 numbers upwards relative to all earlier years. I’d like to have an intelligent conversation with people who want to discuss science, but it appears that a number of people are insistent on drowning out the science. 167 comments? sphaerica is doing yeoman’s work for RC. How about the words potential, maybe, possibly, probable, etc. How many times are these words, including “if”, used in the 2007 IPCC novel? But you believe that now, don’t you. Hmmmm. Oh, come on. You know perfectly well that I was referring to that 1922 article, which Steve cited to highlight that experts predicting an ice-free Arctic have always been wrong. Only problem is that this particular article doesn’t say anything about that. I have little doubt that the Arctic is going to be ice-free some time. The changes happening over the last few years seem to indicate that it’s going to be sooner rather than later. Call me a sceptic, but I can’t share the optimism of many people here who think that the ice has recovered. I find it telling that especially the US Navy is taking a faster melt off into consideration. They probably have better data and prediction models since they care a lot about their submarines and the sailors aboard. No I want you to account for it properly in your calculations. No we want you to understand the science! Take a lake 1km^2 half covered with 1m thick ice, how thick’s the ice? Same sized lake completely covered with ice 0.6m thick, which lake has the thicker ice? PIPS has a 0.28º grid cell half filled with 4m thick ice do they report the thickness for that cell as 4 m or 2m, do you know? Can you reference the answer? Us “idiot savants” need to “cloaca” as often as possible ;~D. Please tell us exactly how you would corrupt the PIPS data to suit your purposes. Most people are immune to facts and rely on authority for all of their beliefs and opinions. The possibility of freedom and responsibility for their own thoughts terrifies them. I’m not sure if you will understand this point, but why do you think your volume calculations are so much noisier than mine? Hint: ice volumes, which are dependent on energy input, should change relatively smoothly. That is if the ice volumes are properly calculated. Your miscalculations of ice volume, just the latest in your series of errors, are adding nothing to science. Unlike you I wouldn’t, try answering my question now. Even if the Navy was as clueless as you insist, you are arguing over the difference between maybe 95% and 100% concentration in your Bremen maps – which is well outside the error of the thickness data anyway. The truth is we don’t actually know if PIOMAS volume estimates are correct without doing real comparisons to observations. 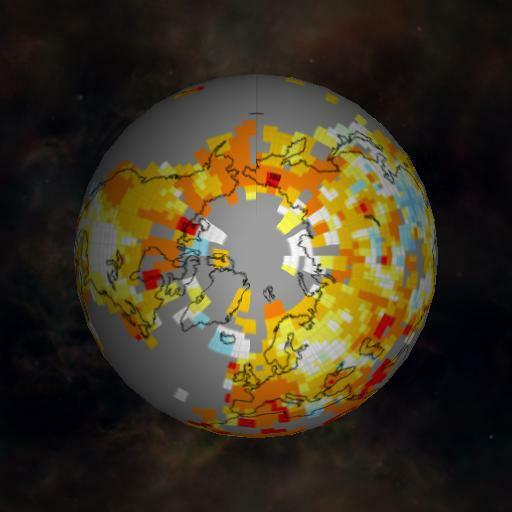 Yes, the model seemed to perform well for the few years of comparisons they made with ICESat data, so perhaps their results are close to reality. Unfortunately, we don’t have Arctic-wide ice thickness observations at the moment (radar altimetry measurements don’t cover the entire Arctic) in order to make a longer inter-comparison. I will say however that the PIPS2.0 model estimates of ice thickness are too large when you compare them to actual observations from either radar or laser altimeter ice thickness values. Thus, any volume calculations made from PIPS2.0 will similarly be biased high. What will be interesting to observe this summer is what will happen to the old ice that was transported into the Beaufort and Chukchi Seas over the winter. If that ice doesn’t survive the summer melt, it will further deplete the Arctic’s store of old, thick ice. A lot of that ice is currently in more southerly locations than it has been in the past several years, which means it is in a warmer location. Looking at all of the evidence given here, pro and con, I am convinced beyond reasonable doubt that the ice build-up in the Arctic is evincing the beginning of a new ice age. The world is completely unprepared for this eventuality. They are reducing and prohibiting our oil and gas reserves, converting food to booze, and having most people, like the Arctic sunbathers in the picture, preparing for a cozy beach day. And who are they? Easy. FAGTs (Feeders At Government Troughs): power hungry govt. bureaucrats, anti free-traders, ivory tower climate “scientist” grantees, windmill makers from La Mancha, and carbon swindlers. Every single one of these are “they”, along with their paid stooges and the under-educated dupes. If the PIPS data is consistently biased high as you suggest, that shouldn’t make much difference to my relative volume calculations. The volume numbers I am presenting are in units pixel-metres, and as long as the bias is consistent from year to year – the relative position along the Y-Axis should be correct. I am not doing anything to the PIPS data. I am using it as is. How in your mind does that constitute “corrupting” it? The Naval Research Station was the first to utilize several of their Cray computers to analyze weather patterns and ocean flows, so Phil does not know what he is talking about. Don’t the oceans cover a little bit of the earth’s surface? Alarmist ? Do I sound “alarmed” to you ? The April 1st National Snow and Ice Data Center Arctic Sea Ice Extent plot continues its unusual upwards trend and is almost intersecting the “normal” line. Given the slope of the current trend it seems highly likely it will intersect the normal line with the April 2nd plot. Other sea ice metrics such as JAXA, using a different satellite platform (AQUA) and the AMSR-E sensor agree. Gee, I wonder how that turned out ? Oh yeah, just missed the average, then fell through the floor. Perhaps you should contact the owner of WUWT and ask him to remove the prominent IARC-JAXA “Sea Ice” link from the Homepage Live Weather Roll and replace it with a link to the more “skeptical” University of Bergen, Norway site. Also of interest is the Nares strait being open this year and the flow of some of the oldest ice through it. The same happened in 2007 but not as early as this year. I find your comments about thick ice in southerly locations interesting. The concern has been that the location of the thick ice retreated to the north in recent years. Now you are expressing concern that it has expanded back to the south. That seems a little inconsistent to me. Since you don’t understand, it’s like this. I do not remember anything insulting in my post, especially when compared to what has been written here in the past two days, by other posters, about me, and particularly since what I was doing was replying to an attack on me and my character. You didn’t snip that attack, but you snipped my response. Please e-mail the original, snipped post to me so I can figure out which part of it I could/should edit and resubmit. Also please, please apply your rules across the board, not just to those that disagree with your own position. without commenting on the data provided. Hmmm, is that cherry picking? For the record, I stick to the same site. I don’t care what site WUWT picks, and Anthony wouldn’t listen anyway, nor would I expect him to. He’s probably trying to accomodate propagandists. To refute your second point, the data from this site illustrates that 2009 was above the “average” extent and area for a period, then “fell through the floor” to ~1 mil. sq km above 2007’s minimum. Not an insignificant recovery. Do you believe a model or actual observations. How did Steve Goddard arrive to his conclusions? By estimating ice volume from the observations. What does the PIOMASS model do? It estimates ice volume from the observations. Now, since both are essentially doing the same thing, explain to me why Steven Goddard’s work is better than that of the Polar Science Center. for this summer, you do see that the summer melt doesn’t quite (but almost does) get rid of all that older ice that has been moved to the more southerly areas. The central part of the Arctic basin has been almost completely cleared of older ice by the September low…and this would not have been the case 5 years ago. It will be most interesting to see how PIOMAS performs this summer. (1) that graph doesn’t show what happened *before* 1980. What was the sea ice volume during the MWP ? (2) There is no proof that the decrease of polar sea ice is due to the increase of CO2 in the atmosphere. (3) And, anyway, what is the inconvenient of less polar ice? of ice-free Arctic? “Arctic Ice isn’t and won’t melt” kick) — and we live to see an event which hasn’t happened in 700,000 years. Your 700,000 yrs is about 2 orders of magnitude too long since the last event. Steve, the thick ice in recent years has been confined to north of Greenland and the Canadian Archipelago. Of course this wasn’t the case say back in the 1980s, but it is true the last several years as the % of MYI ice in the Arctic Basin has dwindled. What happened this winter was that the Beaufort Gyre expanded, leading to transport of some of that old, thick ice in the Canada Basin towards the Beaufort and Chukchi Seas and that lobe of old ice is not turning back northwards to replenish the MYI as would be the case under a typical Beaufort Gyre pattern. I just submitted a paper on this topic. Steve, I should have also added that the lobe of old ice in the Chukchi and southern Beaufort Sea is rather diffuse, so that means when the first-year ice melts out around those MYI floes, they will be subject to more lateral and basal melt than if the old ice lobe was more compact. So what is your prognosis for summer weather in the Chukchi and southern Beaufort Sea? but summer warming is pretty much capped by the fact that there’s just no way to get more than 24 hours of sunlight out of a summer Arctic day, and any GHG (or any other) effect is of course dwarfed by that volume of non-stop sunlight. I’m interested in that statement – would you expand on it? You seem to have touched a nerve or something! There are more trolls on here than the number of “aid workers” that have to sail slingshots to Gaza. But they are really coming out of the woodwork today. For myself, I couldn’t care a fiddler’s fart if the Arctic ice melts “soon” or not. It will refreeze anyway. And if it has been “700,000 years” since last it did (someone’s got some pretty brilliant records, obviously. I wouldn’t put any money on it not having melted in the last 150 years) then perhaps it is about time it did again. Is it really supposed to justify spending Trillions of dollars on “renewable energy” (which incidentally doesn’t work) just because some ice melts? For those who haven’t read my recent articles, the numbers are calculated by doing a numerical integration of ice thickness across all pixels in PIPS images. There is no “estimation” going on. If the Navy images are correct, then my numbers are correct. Ahh, did I neglect to comment on the obvious for your benefit ? Both IARC-JAXA and NSIDC show the most recent Arctic sea ice extent substantially below the value for the same date in 2007. And both IARC-JAXA and NSIDC data are widely quoted on WUWT. That would make the Norwegian Nansen site the odd man out. Perhaps you could find some other site which confirms that 2010 is higher than both 2007 and 2008 for this date – kind of like I just did, confirming that 2010 was less than 2007. Try not to get “alarmed” by what you find. To refute your second point, the data from this site illustrates that 2009 was above the “average” extent and area for a period, then “fell through the floor” to ~1 mil. sq km above 2007′s minimum. Not an insignificant recovery. And I prefer the word contrarian. Odd has such unrefined connotation. Why do you think it is a bad thing to lose old ice? I have to periodically throw out old ice from my ice cube maker because it tastes bad. I prefer fresh, new ice. And is it the old ice that is sinking? (See new article from this WUWT site). I would be upset if I put some old ice in my drink and it sank to the bottom. The fact that ice concentration is a key variable for PIPS, but is assumed to be a constant (equal to 1?) under Steve Goddard’s method of deriving estimates from PIPS website images, obviously could lead to substantial divergence. As several writers have suggested, perhaps even to opposite conclusions. But this hypothesis should be easy to test. If Steve will publish the data resulting from his method, anyone can check that against thesr published PIPS volume estimates. Because of the tilt of the earth, the Arctic Circle gets sunlight 24/7 for a while around the summer solstice. Obviously, under such circumstances, the strength of the sun’s rays are locally a more powerful radiative force than greenhouse gases. If we suddenly had two suns, one on each side of the planet, giving 24/7 sunlight, then it’s clear that the planet would warm immensely. In such a scenario, I suspect GHGs would be relatively inconsequential. In the case of the Arctic, this is what it experiences every summer, 24 hours of daylight. The point I was making is that it will be a long, long time before you see the Arctic get much warmer in the summer, no matter how many GHGs you add, because the radiative strength of 24 hours of sunlight is far beyond what even a tripling of CO2 would provide. Winter, spring and fall are another matter, however, and at those times the effects of GHGs are quite noticeable, as can be seen by following the link in the OP to the seasonal graphs of Arctic temperatures. These increases in temperatures as a result of GHGs will, when temperatures get above freezing, increase the pace of ice melt, and could help to make the melt season longer. The effects of GHGs are always most important at night (when the sun is gone) and in winter (when the days are short), and so the direct effects of the sun are then at their minimum… just like you put on a jacket or heavier coat at night, versus the daytime. Greenhouse gases are, after all, just like a coat or blanket, trapping heat that would otherwise escape into space. Without a blanket, you get cold at night. With a blanket, you stay warm. In the daytime, you don’t really notice the difference because of the sun. Because of the tilt of the earth, the Arctic Circle gets sunlight 24/7 for a while around the summer solstice, just as it gets no sun during the winter solstice, which causes arctic ice to form. Obviously, with 24 hours of daylight, the strength of the sun’s rays are locally a more powerful radiative force than greenhouse gases. If we suddenly had two suns, one on each side of the planet, giving 24/7 sunlight, then it’s clear that the planet would warm immensely. In such a scenario, I suspect GHGs would be relatively inconsequential. The effects of GHGs are always most important at night (when the sun is gone) and so in winter (when the days are short and nights are longer), when the direct effects of the sun are then at their minimum… just like you put on a jacket or heavier coat at night, versus the daytime. Greenhouse gases are, after all, just like a coat or blanket, trapping heat that would otherwise escape into space. Because of the tilt of the earth, the Arctic Circle gets sunlight 24/7 for a while around the summer solstice, just as it gets no sun during the winter solstice, which causes arctic ice to form. Obviously, with 24 hours of daylight, the strength of the sun’s rays are locally a more powerful radiative force than greenhouse gases. The point I was making is that it will be a long, long time before you see the Arctic get much warmer in the summer, no matter how many GHGs you add, because the radiative strength of 24 hours of sunlight is far beyond what even a tripling of CO2 would provide. Winter, spring and fall are another matter. At those times the effects of GHGs are quite noticeable, as can be seen by following the link in the OP to the seasonal graphs of Arctic temperatures. These increases in temperatures will increase the pace of ice melt and could help to make the melt season longer. The effects of GHGs are always most important at night (when the sun is gone) and so in winter (when nights are longer), when the direct effects of the sun are then at their minimum… just like you put on a jacket or heavier coat at night, versus the daytime. Greenhouse gases are, after all, just like a coat or blanket, trapping heat that would otherwise escape into space. Sphaerica, still doing that yeoman work on behalf of RealClimate, I see. The Posey data you presented is described as “Central Arctic.” I suspect that he is measuring in a smaller area than me, so you can’t do an apples to apples comparison with my data. He is looking at a smaller region. Considering the entire Arctic, there was clearly a lot more ice in May, 2006 than May 2007 which disagrees with his numbers. The numbers I am presenting here are accurate representations of the maps. You obviously can’t expect to get the same numbers when measuring different regions. Now look what you did. You made sphaerica mad and he/she/it broke wordpress. Down for over three hours on a rare night when I could be online during TV primetime, and no WUWT. Dang near blew a blood vessel over it. On the off-chance that you might want to check out how PIP actually calculates volume she’s Pamela Posey. I see. You couldn’t find any. Also, Phil. says: May 4, 2010 at 11:20 am had an interesting comment on NORSEX’s problem. I’m sure “Amino Acids in Meteorites’ appreciates your odd efforts on his behalf. Not that you accomplished anything, but that you tried. What’s your purpose of belittling the 2007 IPCC Report? As Roger Whittacker sang, “No I don’t believe in if any more, it’s an illusion” Use the word “if” anytime you like, but don’t drop it when used by someone in order to deceive, by suggesting it is a claim. ( As in “the Arctic will be ice free in 2013 “IF”…)I see the use of “if” for what it is, a qualifier that is qualified. All the words you cited are valid, provided they are not taken out of context. You don’t have to know everything to know something. We don’t have to know about every economic crisis that happened in the past to know what caused the current crisis. ‘Proof’ only exists in mathematics. All other fields of science must deal with the uncertainties of the real world. So there is no proof that smoking causes cancer. Let me ask you: how much certainty do you seek? 80%? 95? 99%? Ah, the safety catch. If my argumentation fails, then I can always say that it didn’t matter anyway. Read here how the model works. Seems to me that it is just a little bit more sophisticated then counting pixels what Steven Goddard is essentially doing. Well, I recently installed some solar panels. Against current energy prices this was an investment that will pay off in about 20 years or so. Prices of PV panels have plummeted over the past 2 years and they continue to do so. Oh, the blessings of mass production. Expect PV electricity to become cheaper for consumers than grid electricity in the next year. Businesses usually have lower rates, so it will take a bit longer for them to reach grid parity. Keep your mind open to the possibility that we might actually save money by switching to renewables. Three things in life are certain: death, taxes and technological progress. Keep your mind open to the possibility that we might actually save money by switching to renewables. Again, I’ll invite Steve to publish his own data for comparison with the PIPS model output. It should just take seconds. Interesting, I had just calculated what the September minimum may be, using June 10 as a starting date and assuming that the remaining melt period (taken as 95 days) would follow 2009. Over that period in 2009 the ice loss, starting at 10.98 million sq kilometres was 60,276 msk per day average, leading to a low of 5.25 msk, a loss of 5.73 msk. Based on my assumption, if I add the 2009 melt to 2010 as of June 10, the result is 4.68 msk. Eerily close to the PIOMAS prediction of 4.7 msk. “(3) And, anyway, what is the inconvenient of less polar ice? of ice-free Arctic? That’s an important topic of research these days, because just about all of the actual Arctic scientists think we’re headed there. Changing such a large white, heat-reflecting surface into a dark, heat-absorbing one will alter thermal properties of the planet. One obvious effect is that Arctic sea ice provides thermal protection to the Greenland Ice Sheet, where mass loss, already accelerating, can be expected to speed further. That will impact coastal cities worldwide and probably ocean circulation such as the Gulf Stream. Similarly, a less icy ocean will accelerate permafrost thawing on land, and clathrate release undersea, both irreversible (on civilization time scales) positive feedbacks to further greenhouse warming. Let me guess? Ministry of silly walks. I knew it! The page you pointed to was based on two reports, one of which was: http://www.clepair.net/windefficiency.html. A tale-telling quote from that report: “Does an efficiency loss of this magnitude actually occur? We were unable to find data on this effect.” The whole article is full of ‘we don’t know’ and ‘we assume’ and ‘we have no data’. And they are guessing there way to their conclusion. Modern combined cycle gas turbines (the units that power companies usually employ as load followers) have excellent partial load efficiency. When it runs at 50% capacity, CO2 emissions are 46% less than at full capacity. See here for example: http://www.power-technology.com/projects/isleofgrain/isleofgrain8.html. With google you can find many more sources that confirm this. Ever heard of ice albedo feedback? Polar bears anyone? In the interest of ‘a picture says more than a thousand words’, let me suggest to take a look at the real time energy generation in Spain. There you can see how they deal with the variability of wind by adjusting CCGT and especially hydro. There is an accompanying page showing only the real time wind power. I think the variability of wind power is overblown. If you look to a single turbine, that might be justified. But you can not simply multiply that by the 1000’s of turbines in a country. Spread out over a larger area, much of the fluctuations cancel each other out and what remains is a large scale variability that looks much like the daily fluctuation in demand, something the energy companies have dealt with as long as they exist. I wish you a lot of luck with “deal(ing) with the variability of wind by adjusting CCGT and especially hydro” in the Low Countries … what are you suggesting ? … a barrage on the IJ or the Merwede to regulate the power grid over here ? Anne: There have been lengthy posts here in the past giving good skeptical replies to the arguments you are making. I lack the expertise to do so, and unfortunately, there is no “category” in this site’s category list for wind or alternative energy, and there is no way (yet) of tagging comments with such categories. I felt a similar frustration in reading Sphaerica’s arguments. There are good rebuttals here, somewhere, and I wish there were a way to point to them. This site should be “mined” to provide a huge set of points and counterpoints, and/or a FAQ.